Master Li trains students in both the contemporary and traditional Chinese Martial Arts, both External and Internal Styles, from the most basic beginning levels to the highest and most demanding levels of proficiency for martial arts competition. His student’s ages range from 5 to over 70 years old. Master Li’s teaching philosophy is to teach his students openly and hide nothing. He will help you be the best you can be. Whether you wish to study for health reasons or for the martial arts, Master Li is happy to guide you along the way. Master Li was born in China and began his martial arts training at the age of 7. He has well over 40 years of wushu and martial arts experience and is one of the few professional Chinese martial artists trained in the classical tradition (while on the Henan Province Wushu Team) and also trained at the prestigious Shanghai Physical Education University, the top wushu/physical education university in China. Not only was Master Li a top wushu competitor in China, he was trained in the science of wushu and taught to train others in martial arts and healing arts. The black and white photo shown below was taken of Master Li in 1979 while he was a member of the prestigious Henan Professional Wushu team. 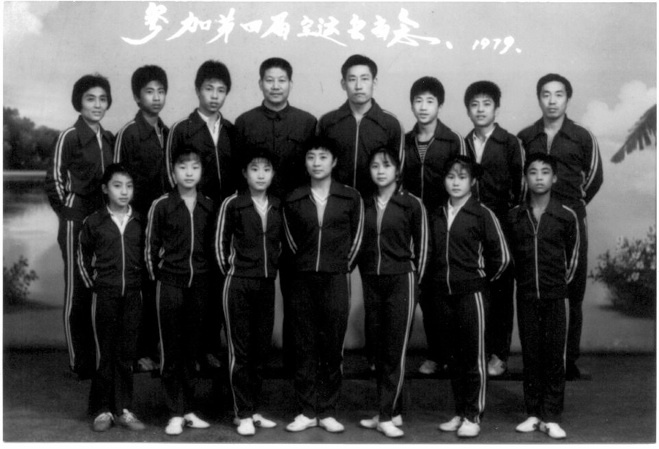 (Master Li is standing third from the right in the back row, just to the right of his teammate Chen style tai chi Master Chen Xiaowang.) Most of the members of this team have become masters in their own right. You might recognize the young boy in the far right of the front row as nine (9) time consecutive Chen Style Tai Chi Chinese National Champion, Master Ding Jia (now residing in Japan). From 1977 through 1990, Master Li competed actively in China and won literally thousands of gold and silver medals in both weapons and forms. Most notably, he won the gold medal every year from 1977 through 1982 in the Henan Province Kung-Fu competition in four different events; Nan Quan (empty hand form), Sword, Pairs and Long Stick (also known as Staff or Jo). While in college, Master Li won the 1990 gold medal in the Long Stick form event in the Chinese National Competition making him the world champion of this event. Master Li was trained by many of the top wushu and tai chi masters in China and has been trained to pass on his knowledge to his students. Not all Chinese professional martial artists go on to college to study both Eastern and Western science disciplines. Master Li is one of the few professionals to receive formal secondary education in his art. Not only did he attend one of the most prestigious schools in China (Shanghai Physical Education University), Master Li graduated 1st in his class of 400 where he earned a Bachelor of Arts degree in Chinese Martial Arts and Sports Medicine. His training at the University included instruction in Advanced Kung-Fu Theory and Styles, Basketball, Track, Soccer, Gymnastics, Swimming, English, Sports Pedagogy, Theory of Sports Training, Exercise Biochemistry, Sports Biomechanics, Anatomy, Exercise Physiology, Weight Lifting, Sports Psychology, Sports Medicine, Traumatology and Massage. After earning his degree, Master Li became an instructor at Fudan University, Shanghai, China, from 1993 to 1997 where he taught Wushu, Tai Chi, Sports Nutrition, Soccer, Track, Basketball and Gymnastics. He conducted self-defense classes for women and physical therapy classes for disabled students. Master Li coached the Fudan University Kung Fu Team for state competitions and was selected by the Shanghai Kung Fu Association to judge at the highest ranked Chinese National Kung Fu Tournaments. Not only has Master Li trained adults in China, he has considerable experience training children and young adults. Master Li was the Kung-Fu coach at Shi Hing Chun Elementary School, Shanghai, China from 1991 through 1993 where he coached beginning and intermediate Kung Fu Classes. Master Li was also the instructor of physical education and Kung-Fu at the Commune for Physical Education in Zhong Yuan City, China, from 1983 through 1989 where he selected and coached athletes for competition at state and national Kung Fu tournaments, instructed beginning through advanced Kung Fu and taught general physical education classes and coached the commune’s soccer team. Master Li acted in Chinese Kung Fu Films between 1983 and 1993. (Titles available upon request). He performed individual roles and doubled for male and female co-actors in Kung Fu scenes. Li Pei Yun moved to the United States from China in April of 1997 and has become a citizen of the United States.